Simvastatin is a competitive inhibitor of HMG-CoA reductase with Ki of 0.1-0.2 nM in cell-free assays. Representative images of p-Akt and p-GSK-3β expressions by western blot in the subgranular zone (SGZ) of the hippocampus. Rosuvastatin Calcium is a competitive inhibitor of HMG-CoA reductase with IC50 of 11 nM in a cell-free assay. MDA-MB-231 cells were treated with simvastatin (SIM) or rosuvastatin (ROSU) in combination with ZOL for 48 h. Vitality and apoptosis were measured by using the cell titer blue and the caspase 3/7 Glo assay. Data are shown as mean ± SD of at least three individual experiments (*p ≤ 0.05; **p ≤ 0.01; ***p ≤ 0.001). Pitavastatin calcium, a novel member of the medication class of statins, is a calcium salt formulation of pitavastatin which is a highly effective HMG-CoA reductase inhibitor. Western blotting showed that in U87 cells treated with pitavastatin, the LC3-II isoform dramatically increased after statin treatment and showed at day 2, 3 and 4. Lovastatin is an inhibitor of HMG-CoA reductase with IC50 of 3.4 nM in a cell-free assay, used for lowering cholesterol (hypolipidemic agent). To evaluate the role of cell cycle progression in androgen induced DSB formation, LAPC4 cells were either treated with solvent control or 50 μM lovastatin for 36 h prior to stimulation with 100 nM DHT for 6 h. Note that androgen induced γH2A.X foci formation was not different between control and lovastatin pre-treated cells. Fluvastatin Sodium inhibits HMG-CoA reductase activity with IC50 of 8 nM in a cell-free assay. The concentration of lanosterol slightly increases (f) and that of desmosterol significantly increases (g) in the brains of fluvastatin-treated 129.Mecp2tm1.1Bird/Y mice at P70 (n = 4 mice per group; P = 0.042). *P ≤ 0.05 determined using Dunnett’s post-hoc test to compare statin- with vehicle-treated groups. All error bars represent the s.e.m. Atorvastatin is a lipid lowering agent. It is a competitive inhibitor of hydroxymethylglutaryl-coenzyme A (HMG-CoA) reductase, the rate-determining enzyme in cholesterol biosynthesis via the mevalonate pathway. 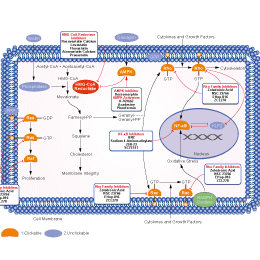 Pravastatin is a lipoprotein-lowering drug via reversibly inhibiting hydroxymethylglutaryl-CoA (HMG-CoA) reductase and the synthesis of very-low-density lipoproteins. Rosuvastatin is an inhibitor of HMG-CoA reductase, an enzyme that catalyzes the rate-limiting step in cholesterol biosynthesis, with Ki value (inhibition constant) of approximately 0.1 nM. Atorvastatin Calcium is an inhibitor of HMG-CoA reductase used as a cholesterol-lowering medication that blocks the production of cholesterol. Micrographs of hematoxylin and eosin-stained liver sections from untreated and atorvastatin-treated TO mouse. Results of representative experiment of liver specimens incubated in vitro at 37癈 with and without 1.0 礛 atorvastatin for 6 hr is shown. A liver specimen at 0 hr is also shown. Liver structure and cytology are preserved in treated and untreated specimens. Inflammation and cholestasis are absent. (Hematoxylin and eosin, 10?and 40?. Pravastatin sodium is an HMG-CoA reductase inhibitor against sterol synthesis with IC50 of 5.6 μM. B, Uptake of DHEAS in PC cells with 2.5 µM DHEAS and different concentrations of statins when incubated for 60 minutes. Statistical analysis was performed by comparing each condition with the DHEAS 2.5 µM and no statin state except when indicated. Clinofibrate inhibits hydroxymethylglutaryl coenzyme A reductase (HMGCR) with IC50 of 0.47 mM, is a lipid-lowering agent used for controlling high cholesterol and triacylglyceride levels in the blood. Mevastatin is a competitive inhibitor of HMG-Coenzyme A (HMG-CoA) reductase with a binding affinity 10,000 times greater than the HMG-CoA substrate itself. SAHA and Statins on the proliferation of TNBC cells. TNBC or MCF-10A cells were treated with (D) Mevastatin, (E) Mevastatin + 0.5 μmol/l SAHA. Except for that a final concentration of 0.5 μmol/l SAHA was used in combination groups, serial 2-fold dilutions of each compound in a final concentration range of 32–0.03 μmol/l were used in experiments. Cell counting was assessed by using CCK8 reagent at 72 h after treatments. Dose-response curves were plotted as concentration (logarithmic scale) versus normalized response-variable slope using non-linear regression by software Prism 5.0 (Graphpad). Experiments were performed in triplicate, and data were presented as the mean±S.E.M. SR-12813 is a pregnane X receptor (PXR) agonist and HMG-CoA reductase inhibitor with an IC50 of 850 nM.